My daughter was recently married, and I wondered about the average cost of a wedding cake and along with the dress, the venue, the favors, and all the other essential stuff, would the cake be a big or small expense? I don’t live in the state where my daughter resides so I asked her to obtain some prices based on the number of guests expected at the reception—approximately 200; which I found is really considered a big wedding. At first, I was astonished that a two-tiered wedding cake with a fountain would cost us around $1,500 dollars. Included in that cost the biggest part was obviously the cake itself, but the type of icing also makes the price rise. For example, what they called “fondant" icing is much more expensive than a typical buttercream or other type of frosting. Another surprise was the small little fountain my daughter saw in a bridal magazine and its cost. Of course one can go for fountain elements that are made of expensive materials, but most wedding cake makers use plastic elements that are fairly inexpensive. 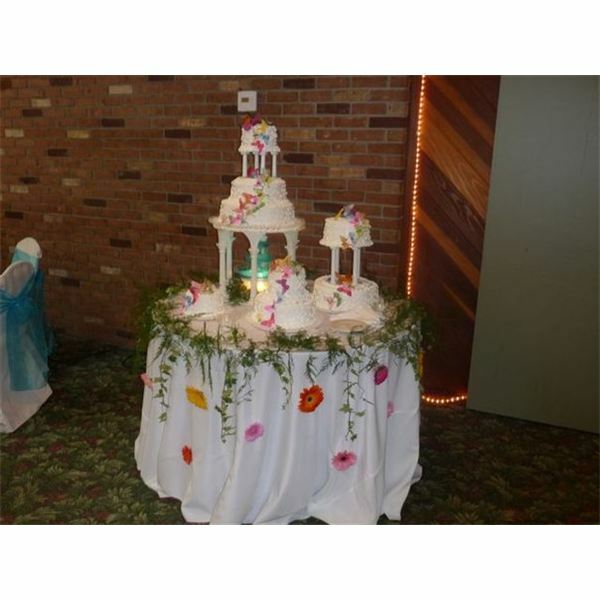 Of the $1,500 for the cake our baker wanted, the fountain elements were only $75! Not happy with the price of $1,500 for a two-tiered wedding cake, I began my search for the average cost of a wedding cake and looked for ways to save some wedding expense dollars. Perfect Wedding Day is one of the numerous places I found that offers real information on the average cost of a wedding cake. Many specialty bakeries that deal only in cakes can cost you a lot if you’re not careful. According to Perfect Wedding Day, the average cost of that cake for the reception is based on a two-tiered cake, choice of fruit, finger size portions, buttercream frosting, simple yet tasteful decorations and fresh flowers. The cost is $5.50 per slice, and if you decide you want to go really big and add a tier or two add $0.50 to each tier per slice, or $6.00 and up depending on how many tiers you want. Based on my daughter’s desired cake, according to this price at $5.50 per slice for two tiers, the base price would be $1,100, plus $75 for the waterfall elements, or $1,175. So, why in the world was my daughter’s cake priced at a whopping $1,500? Buy your own decorations. In our case, my daughter wanted butterflies. There are numerous websites that offer products like these to both wholesale and retail customers. This cost us $50. Buy your own flowers. Even if you want real flowers, you can find a wholesale place or even a local supermarket that has fresh flowers. Total price was $50. Buy your own waterfall elements. Again, we found an online website that offered plastic waterfalls but cost me only $25. Find a local baker. This really surprised me; those out of the way bakery shops are full of talented people who will build the same two-tiered caked with your purchased elements for only $1,000. So in all, I paid $1,000 for the cake, $50 for the butterflies, $50 on the fresh flowers and $25 on the waterfall bringing the total to $1,125, actually $50 cheaper than the average cost of a two-tiered wedding cake. 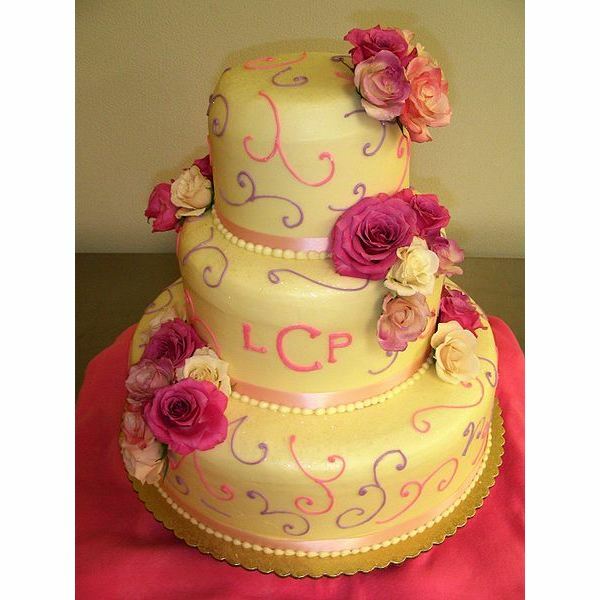 If you click on the image to the above right this is my daughter’s actual wedding cake! Keep your budget in mind when deciding upon the type of cake you want. Although it’s an essential and beautiful part of your day, it will be eaten and most of decorations (and waterfall) will be discarded. Often simple, yet elegant is your best bet.